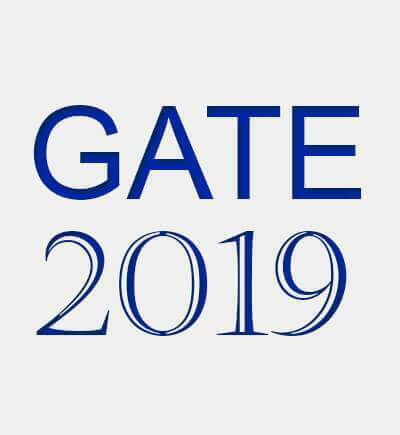 The official syllabus for GATE 2018 Exam has been notified on the official website of GATE. Candidates who are looking forward to appear for the exam should be aware of the syllabus for their respective paper to prepare for the GATE 2018 Exam accordingly. As GATE 2018 Exam will be conducted on 23 subjects (papers), you should know the complete syllabus of the paper you will be appearing for. Below we have provided the complete official GATE 2018 Exam Syllabus for each paper with their chapters. In XE Paper section, while Engineering Mathematics paper is compulsory, candidates can choose any 2 sections from the rest of the subjects. Equivalent force systems; free-body diagrams; equilibrium equations; analysis of determinate trusses and frames; friction; particle kinematics and dynamics; dynamics of rigid bodies under planar motion; law of conservation of energy; law of conservation of momentum. Stresses and strains; principal stresses and strains; Mohr’s circle for plane stress and plane strain; generalized Hooke’s Law; elastic constants; thermal stresses; theories of failure. Axial, shear and bending moment diagrams; axial, shear and bending stresses; combined stresses; deflection (for symmetric bending); torsion in circular shafts; thin walled pressure vessels; energy methods (Castigliano’s Theorems); Euler buckling. Free vibration of single degree of freedom systems. In XL Paper section, while Chemistry paper is compulsory, candidates can choose any 2 sections from the rest of the subjects. Organization of life; Importance of water; Structure and function of biomolecules: Amino acids, Carbohydrates, Lipids, Proteins and Nucleic acids; Protein structure, folding and function: Myoglobin, Hemoglobin, Lysozyme, Ribonuclease A, Carboxypeptidase, and Chymotrypsin. Enzyme kinetics including its regulation and inhibition, Vitamins and Coenzymes ; Metabolism and bioenergetics; Generation and utilization of ATP; Metabolic pathways and their regulation: glycolysis, TCA cycle, pentose phosphate pathway, oxidative phosphorylation,gluconeogenesis, glycogen and fatty acid metabolism; Metabolism of Nitrogen containing compounds: nitrogen fixation, amino acids and nucleotides. Photosynthesis: Calvin cycle. Biochemical separation techniques: ion exchange, size exclusion and affinity chromatography, Characterization of biomolecules by electrophoresis, UV-visible and fluorescence spectroscopy and Mass spectrometry. Cell structure and organelles; Biological membranes; Transport across membranes; Signal transduction; Hormones and neurotransmitters. Immune system: Active and passive immunity; Complement system; Antibody structure, function and diversity; Cells of the immune system: T, B and macrophages; T and B cell activation; Major histocompatibilty complex; T cell receptor; Immunological techniques: Immunodiffusion, immunoelectrophoresis, RIA, and ELISA. So, this is the official syllabus for GATE 2018 exam for every subject. Candidates are suggested to prepare for their respective exam according to the above-given syllabus.